The site of Clintsfield Colliery is remarkable today for the ruin of the 19th-century engine house (SD 6297 6978) built to house a steam beam engine for pumping and for the extensive ground works associated with the operation of a late 18th-century/early 19th-century colliery. Fig 2 shows its present state and a sketch of the engine house’s probable original appearance. 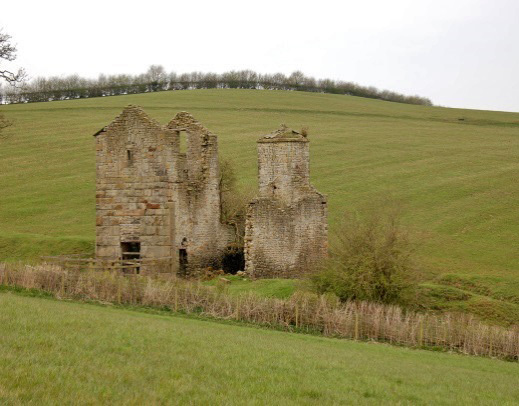 Clintsfield engine house is Grade II listed and the whole field in which is situated is a scheduled historical monument.1 It is located on private land and there is no public access. 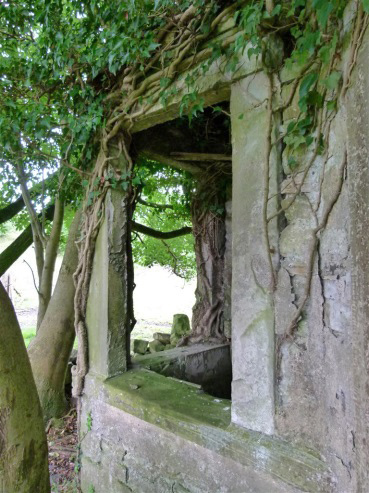 Images in this article were collected during prearranged visits to the site by Tatham History Society in August 2015. Its survival derives from the fact that there has been no development on the site since the 1860s. The site does not have easy access to public roads or other properties. The surrounding field has not been ploughed and there have been no attempts to fill in the earthworks associated with the colliery. 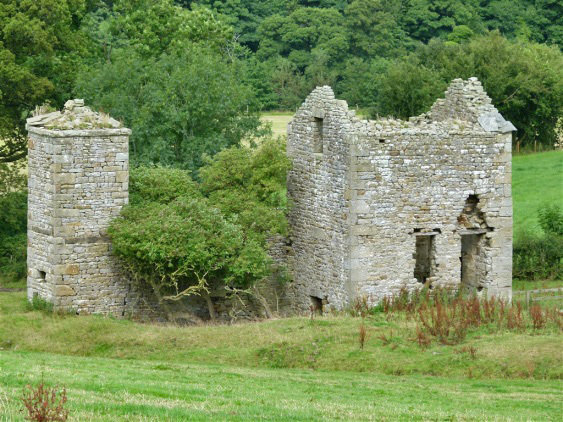 The engine house itself was very well built and any damage and modifications to the walls seem to be associated with its subsequent conversion to a short-lived residence. Despite losing its roof all the other walls remain extant and solid, a tribute to Arthur Burrow, the stone mason who erected it. The coal here is interbedded with the Accerhill Sandstone and varies from 16 to 24 inches thick. It lies above the coal horizon worked at the nearby larger Tatham Colliery (Ward's Stone Sandstone) but it was also worked at an outlier of the Smeer Hall Colliery at Stauvin, as well as at collieries further east in the Bentham coalfield.4 The map shows the sandstone outcrop and the interpreted position of the coal at the bedrock surface, i.e. beneath the cover of glacial sediments. The beds dip at around 20 degrees to the NE which would put the shaft depth near the engine house at 70 metres. The area available for working the coal was severely limited by the network of large faults plus any minor ones encountered. These would cut out the coal being followed in the workings and make digging new shafts a risky business. 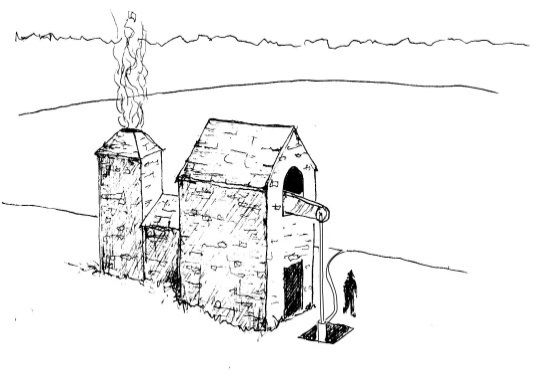 Several of the shafts shown would have failed to find coal. 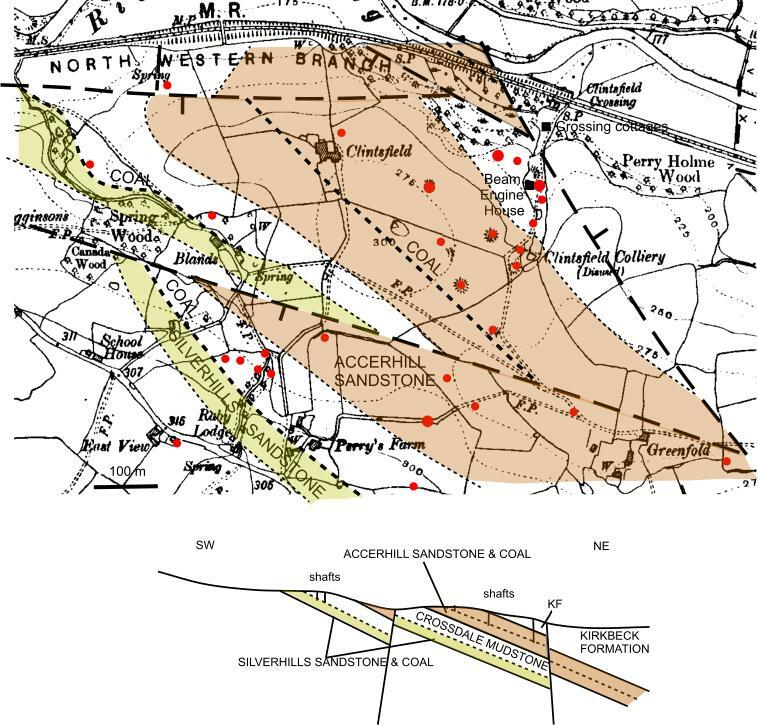 A second thinner coal underlay the Clintsfield coal in the Silver Hills Sandstone and it was mined in shallow working at Blands, Raby Lodge, Perries & Robert Hall. None of these became an established colliery. 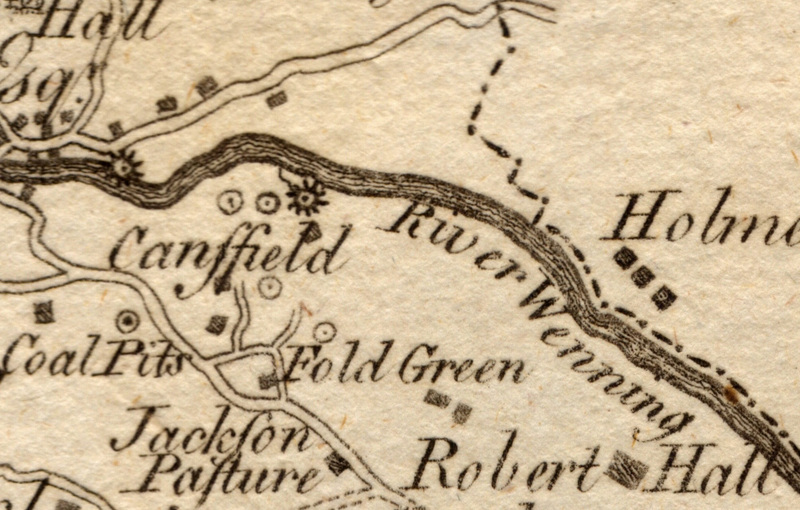 The site was accessible from the west (off a track to Clintsfield farm) and south (via tracks to Greenfold farm and on to Robert Hall) but, as the first OS maps clearly show, at one time also had access to the north via a wooden bridge over the Wenning in the 1840s. This would have provided access to the village of Wennington but, more importantly, to the larger industrial settlements at Low and High Bentham which were important for its closing years. (see below) It had disappeared by the time of the second edition OS map in 1890. 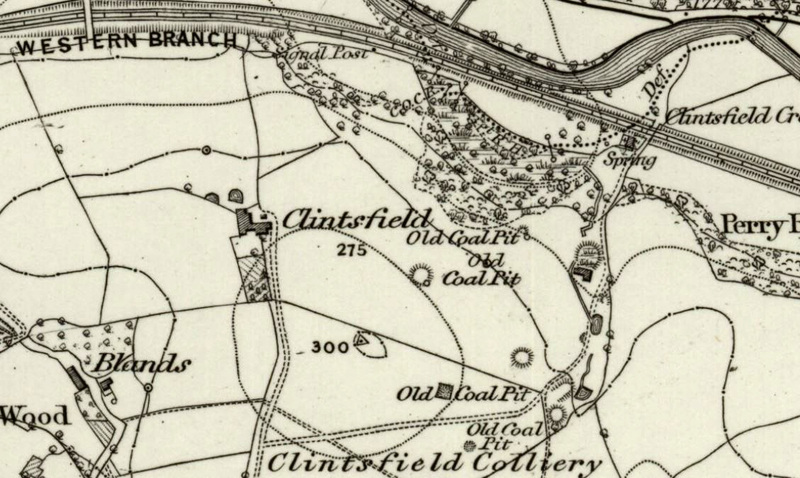 At Clintsfield, 20 pits have been located, with five of these indicated as ‘old’ on the 1847-50 OS map and four, described as just pits, were presumably active (larger red dots), including the beam engine shaft. The remainder are taken from the large scale BGS field maps (1991-92) and personal fieldwork. (The area north of the railway has not been covered by BGS). All the pits were described as ‘old’ in 1890. Fig. 4: 1st edition OS 6” c 1847-50 showing coal pits, ruins and wooden bridge over Wenning. Fig. 5: 2nd edition OS 6” revised 1890, showing old pits, engine house and associated with reservoirs. The bridge has disappeared. There is no indication of the number of men and boys who worked there at its peak. Miners are recorded in both the parish registers from the late 18th century and in the 1841 census of the parish at Bridge End, Sod Hall, Outlay, Millhouses, Moor End, Moorside, Perry Moor and School House, but many of these could have been employed elsewhere in the district. Old cottages at nearby Greenfold farm are reputed to have been miners’ residences; these are now used as farm buildings. Both registers and the 1841 census are likely to have underestimated the numbers employed in the area, since the registers only recorded the occupations of adult males and the census of 1841 did not consistently report the occupations of women and children. The shallowness of the seams, a maximum of 24 inches (60 centimetres), would have made working conditions very difficult and it is likely that, as at nearby Smeer Hall, children and adolescents were employed in many of the menial tasks, such as dragging baskets or sledges from the coal face to the shaft. It is also possible that other members of the family were employed above ground, as in south Lancashire collieries of that period. 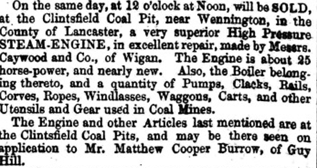 George Sergeantson, who operated the Ingleton collieries was approached by Roughsedge to operate Clintsfield in 1842. His account, written later that decade, underlines the reason for Roughsedge’s purchase of the colliery lease. Despite Sergeantson’s withdrawal, Hornby Roughsedge would appear to have extended his lease beyond 1848, however, since his name appears in the accounts as paying £80 pa to the Gerards until 1853, but the mine would not seem to be operational during this time since it was reported in 1855 to have been closed for several years due to flooding. His interest in the mine presumably waned when access to railway coal provided a more convenient way of obtaining fuel but in 1850 he sold the Bentham mills to Messrs Waithman & Co. and retired to Fox Ghyll, near Ambleside. It would appear that the bridge was damaged in the winter of 1855-56 since in December George Moss at Clintsfield farm was given a rent abatement because his men and horses had been used during bridge repairs. This may well account for Sewart’s advert the following month informing his customers of the plentiful supply now available and reducing the prices.18 These prices, however, were still considerably higher than those obtained by Sergeantson a decade earlier. Fig. 9: Lancaster Gazette, 11 & 18 Oct. 1856. The following year Gerards attempted and failed to find a new tenant. 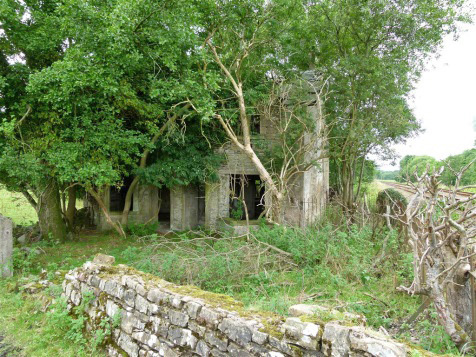 By 1861 the engine house had been converted into a house with additional first floor and hearths and was inhabited by a young agricultural labourer from Wennington and his family.23 There were no inhabitants in subsequent censuses. 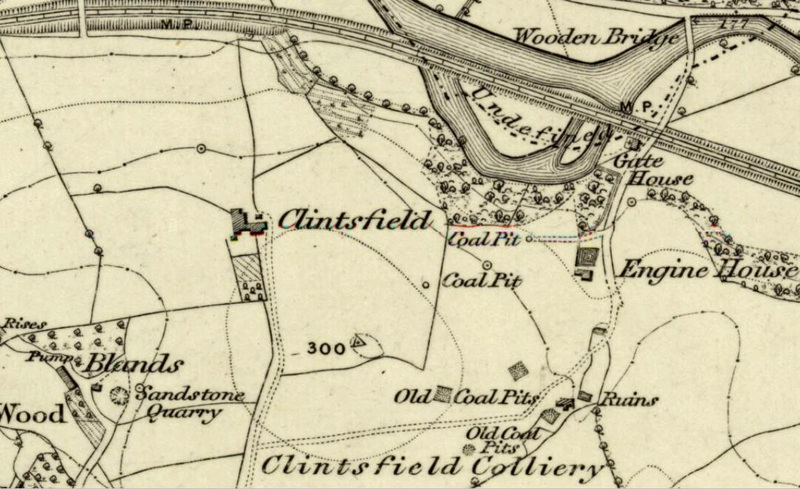 There were clearly attempts to reopen some of the workings in the Clintsfield area in 1863 and an advert in 1873 implies some working of the upper coal seam continued and that there was a ‘ready demand on the spot’, but it also suggests that it was not being fully exploited.24 However, no rental income is shown in Gerard’s accounts. 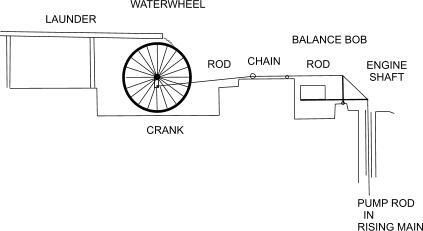 The simplest means of converting the wheel's rotation to horizontal reversing motion was to have a crank arm on the wheel axis. This was transmitted by a combination of rods and chain to a weighted balance bob at the engine shaft which converted it to the vertical reversing motion of the lift pump rods. An overshot wheel would be the most powerful, but a breast or even undershot could be used. The beam engine housed in the engine house was obviously installed to drain the later workings which would lie well below the water table. Sales of equipment at the colliery invariably refer to pumps. There is no indication that it was also used for raising coal, as such engines did elsewhere. The two small ponds created further upstream on the beck (see map) would have supplied clean cold water to the condenser and the boiler would use that source as well as warm water from the condenser over flow. The contaminated water pumped from the shaft could not be used for these purposes and the embanked pond below the engine house may have been for its storage and passive treatment, e.g. oxygenation and iron oxide precipitation, before release to the river. 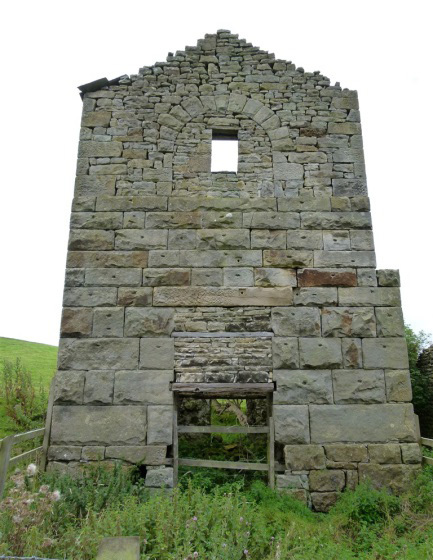 The construction of the new engine house is referred to by George Smith in October 1839 when he measured the stone supplied by Arthur Burrow of Blands for masonry work which was carted by Richard Fayrer and Thomas Alderson, tenants of Clintsfield and Greenfold farms.30 The obvious source would have been the sandstone quarry in Bland's front yard shown on the OS map. The new engine house, therefore, was built after Roughsedge had taken over the lease of the colliery in August 1839. The wooden bridge over the Wenning was probably built at the same time. The accounts for the mid-1830s show that Cort had paid his rent up to six months in arrears and did not pay the rent due in December 1838 until June the following year. The £35 due in May 1839, therefore, would have been paid by Roughsedge but the rental records suggest this was waived since no date of payment is recorded. Instead it was ‘allowed at the same time for Bridge’. There are no earlier references to a bridge. A further £15 was allowed in December 1840. Thereafter, unlike Cort, Roughsedge always paid on time. The principle of the beam engine is that the weight of the pump rods down the shaft forces the mine water into the bottom of a lift pump through a non-returnable clack valve (such as in a hand pump on a well). 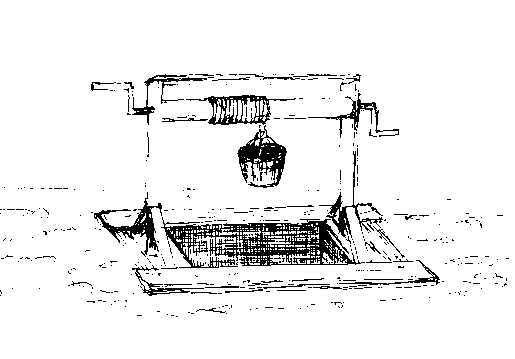 This is then raised up by a piston attached to the other end of the beam which is pulled down into a cylinder by a partial vacuum created below the piston by condensing steam to water. In the original Newcomen atmospheric engines from 1712 onwards it was the air pressure which pushed the piston down. Then in 1769, Boulton and Watt added pressure from steam introduced above the piston to improve the down-stroke, as well as increasing the vacuum by removing the condensation from the cylinder to a separate condenser, thus maintaining the temperature of the cylinder and reducing fuel costs. This became the standard single-acting engine. A later modification by Watt assisted the up-stroke of the piston caused by the weight of the pump rods, by introducing steam below the piston at the appropriate moment, i.e. creating a double-acting engine. After the expiry of the Boulton and Watt patent in 1800, many varieties of these engines were produced by others. The small size of Cort’s 5 hp engine at Clintsfield suggests a very early model, perhaps even a Newcomen, as second-hand ones continued in use in northern collieries. The information on the 25 hp engine is more instructive, suggesting it was a double-acting engine using high-pressure steam. Although built by another firm it is likely to have resembled Boulton and Watt engines of the early 1800s such as the 38 hp engine of 1809 still in working order on the Kennet and Avon canal where it supplies water to the summit stretch.34 Comparison with this suggests the Clintsfield engine probably had a cylinder of about 28 ins diameter, a piston stroke of 7 feet and a tempo of 10 power strokes per minute, i.e. a nod every 6 seconds. Fig. 13: Speculative cross-section of Clintsfield engine house from the east. The up-stroke and down-stroke of the piston reflect the opposite strokes of the pump rods. The piston down-stroke is the main steam powered stroke although in the double-acting engine the up-stroke is a lesser power stroke. The valve sequence when the engine is running is operated automatically by rods (plug rods) connected to the beam (not shown) which trigger the various levers actuating the valves. With the piston at the top of the up-stroke, the inlet is open and high pressure steam fills the cylinder and condenser (valve A & C open, B closed). Turning the cold water jet on initiates condensation, reducing pressure below the piston and starting the down stroke. Expansion of the steam above the piston aids this (valve C open, B closed and A closed at half down-stroke). At end of down stroke, steam from above the piston is introduced below it by opening the equilibrium valve (B), so equalising the pressures and aiding the up-stroke as the beam is tilted by the weight of the pump rod (valve C & A closed, B open). 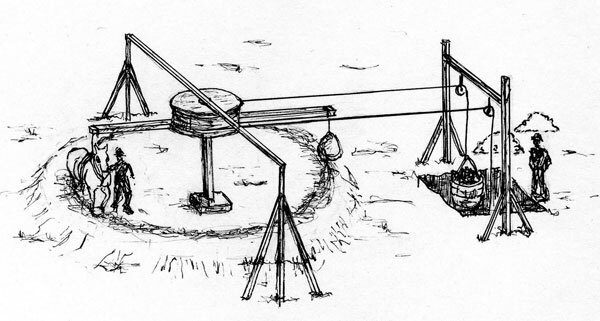 It is likely that at this time the beam was cast iron and the correct movement of the piston rod was achieved by the parallel motion linkage invented by Watt, rather than the curved ends and chain linkages of the earlier wooden beams. 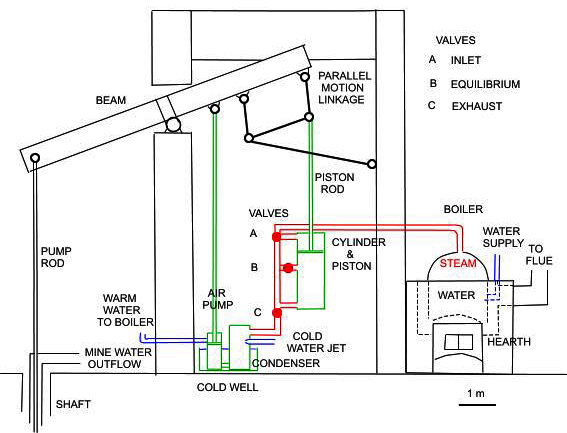 There was probably also an air (lift) pump driven by the beam which pumped the spent warm water from the condenser and added it to the boiler supply. The diameter of the shaft lift pump is not known but if it was only 10 inches then it could be pumping 100 litres per stroke or one cubic metre per minute for a coal consumption of about 15 cwt./day. The Leeds-Skipton-Morecambe railway crossed the site to the north which opened on 1 June 1850 and clearly affected the colliery in a number of ways.35 Opinion at the time was divided about whether the railway would open up new markets for local coal, or undermine their operations by importing coal from mines elsewhere. The latter proved to be correct. The railway also cut across the track to the wooden bridge to the north, necessitating the provision of a gated level crossing. The North Western Railway constructed two semi-detached cottages adjacent to the crossing. These housed two families of permanent way workers (plate layers) recorded in the censuses of 1861-1911, but not 1901. In 1891 two of their children were silk workers, presumably at Low Bentham Mill.36 These cottages incorporate unusual triangular bay windows, from which it would have been possible to view both the track to railway from both the river and the colliery. Water supply was obtained from a spring and well in the old river bed behind them, although local residents recall that the inhabitants also brought water along the rail track from Wennington. They also used the railway for pedestrian access. Figs. 14a, 14b & 14c: Clintsfield railway cottages, 2015. These cottages were inhabited until the 1950s. They even housed an evacuee during the Second World War. Residents of Clintsfield farm recall that the cottage front gardens were well tended and full of flowers. 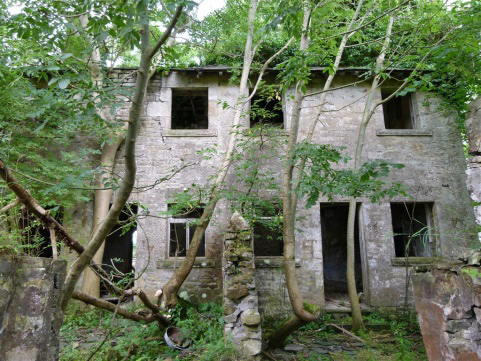 Today they are abandoned and, without any possibility of public access and amenities being made available, nor prospect of renovation. All remnants of the wooden bridge over the Wenning have disappeared. 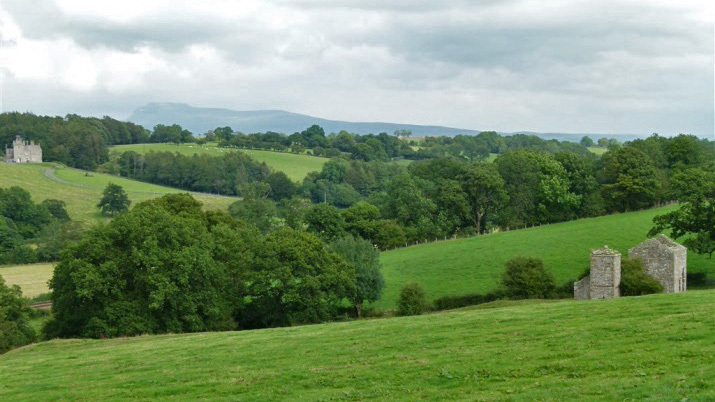 1 Historic England web pages: Listing ; Ancient Monument both accessed 22 August 2015. 3 Lancashire Archives, DRB/1/183, Tatham Tithe Schedule, field no 466: 'Pit field'; 464, a field by the river, is known as ‘Gin Holme’. 4 Kelly, Lune and Upper Ribble Coalfields, 52-53. 6 Kelly web article: ‘Tatham Colliery’; Hudson, Coal Mining in Lunesdale; Kelly, Lune and Upper Ribble Coalfields gives references to other descriptions. 7 Lancs. Archives, DDGe (M) 1619 Settlement by Sir John Gerard of the manors of Robert Hall and Cansfield and other heriditaments, 19 December 1826. 9 Hudson, Coal Mining in Lunesdale, 161 for lease; 198 for details of Martin family. The location of this lease is not stated. William Storrs (collier) had married Agnes Hodgson at St James the Less church on 14 Feb.1765. 11 George Smith’s diary 19 November 1832. 12 Lancs. Archives, Procter and Birkbeck papers, DDPC 2/8/1, Gerard accounts. 13 ‘Ingleton Colliery’ transcript of G.J. Sergeantson memoirs 1844 (memoirs actually continue to 1847) copy held NMRS society. 14 Bradford Observer, 3 March 1853. 15 Further article about his background and activities is planned. 16 Westmorland Gazette, 30 Dec. 1854; 19 May 1855. 17 Lancaster Gazette, 31 March 1855; Lancs. Archives, DDPC 2/8/2, 7 Oct. 1863. 18 Kendal Mercury and Westmorland Gazette, 19 Jan. 1856. 19 Lancaster Gazette, 26 April 1856. 20 Lancaster Gazette, 26 July 1856. 21 Cumbria Archives, Kendal, Hoggarth Solicitor’s papers, WDB 35/1/272 Sales Particulars, 24 Sept. 1856. 22 Lancaster Gazette, 11 & 18 Oct. 1856. 23 John Travis, 33, with wife Anne and three young children. He remained in Wennington for the rest of his life. 26 G Baker, letter to Lancaster Guardian, 6 August 1872. 27 www.spirit-of-the-miners.org.uk/waterpower.php accessed 21 Sept. 2015. 28 Hudson, Coal Mining in Lunesdale, 147. 29 Information from field trip to colliery with Tatham History Society, 22 August 2015. 30 Smith’s diary, 12 Oct. 1839. 31 Smith’s diary, 24 May 1826. 32 Blackburn Standard, 18 December 1839. 33 Lancaster Gazette, 11 & 18 Oct. 1856. 34 Anon, The Crofton Pumping Station Guide (Kennet & Avon Canal Trust, 2008), 39 pp.